For many years the general store has been the permanent exhibit in the second room of the History Museum. Visitors were able to see housewares and clothing items that would have been sold many years ago. Discussions were held at Museum Committee meetings, and an idea came up to create a new permanent exhibit that tells the history of how our community was developed. The project was fully underway last fall, after the Museum closed for the season. The artifacts in the general store were moved into storage and the room w as cleared out to make way for the exciting new project. The Museum Committee put many hours into researching and writing. The exhibit room was painted, with assistance from the Rotary Club and given a bright new look. New display panels were created and now photos and artifacts are being placed in their new spots. “The History of Lake Placid” exhibit will be shown in two parts. This summer we are unveiling the first section. “The Early Years” covers the history from the 1800s to approximately 1920. By closely following Mary MacKenzie’s book, “the Plains of Abraham,” we were able to learn what events were most notable. The book allowed us to fully understand the timeline of the town’s history. The exhibit will share stories of early settlers, industry, and transportation of North Elba. The Historical Society has a great collection of photographs from the Newman section of town and the stores that once occupied the area. The history of the grand hotels and life on the lake will be depicted. One artifact that will be highlighted in the exhibit is the Newman Post Office, which happens to have a fascinating story that goes along with it. In 1883, a village post office was established in a store next to Mirror Lake on Main Street. Those that lived in the bustle of town by the train station were unhappy about the placement of the new post office. It was quite a distance from that area of town. Upset citizens decided to take matters in their own hands by contacting the Postmaster General of that time, John Wanamaker. They sent a petition requesting their own branch. Along with the petition, a personal note was written by Lake Placid citizen, Anna Newman, who happened to be a childhood friend of Wanamaker’s in their native city of Philadelphia. The response came quickly, and in 1891 the lower area of the village received their own branch named “Newman.” Although no official bounds were set by the town officials and no mail carrier service existed, the post office operated near the train station in various stores for many years. 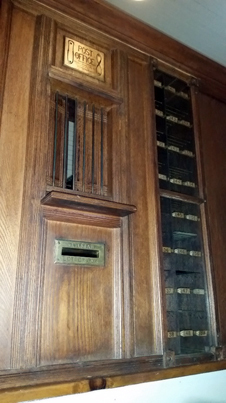 The original post office counter and boxes, as one unit, will be on exhibit. We hope that you will join us as we celebrate the opening of the exhibit. It will be held on Thursday, June 18th, 5-7pm ($20 donation). To RSVP, please e-mail info@lakeplacidhistory.com.